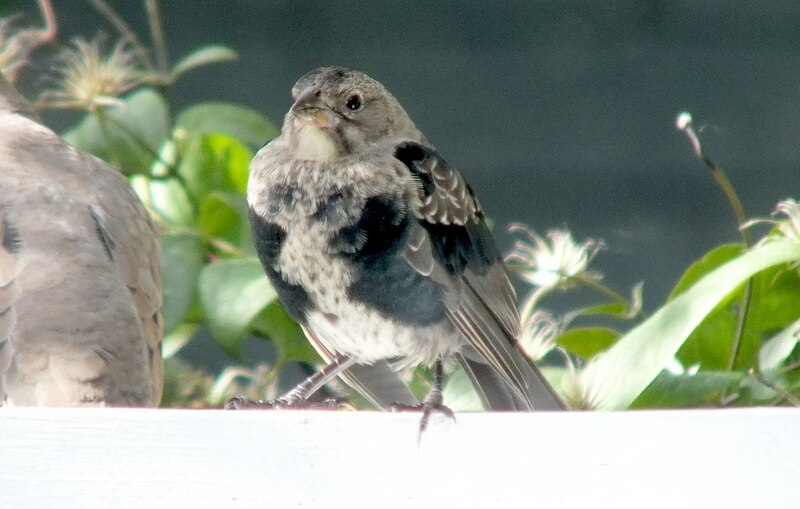 One fall, Bob and I were so excited to see what we thought was a new bird sitting on our backyard arbour. Trouble was, we couldn’t find the bird in any of our bird books, so we turned to Toronto and Southern Ontario Birding for their input. 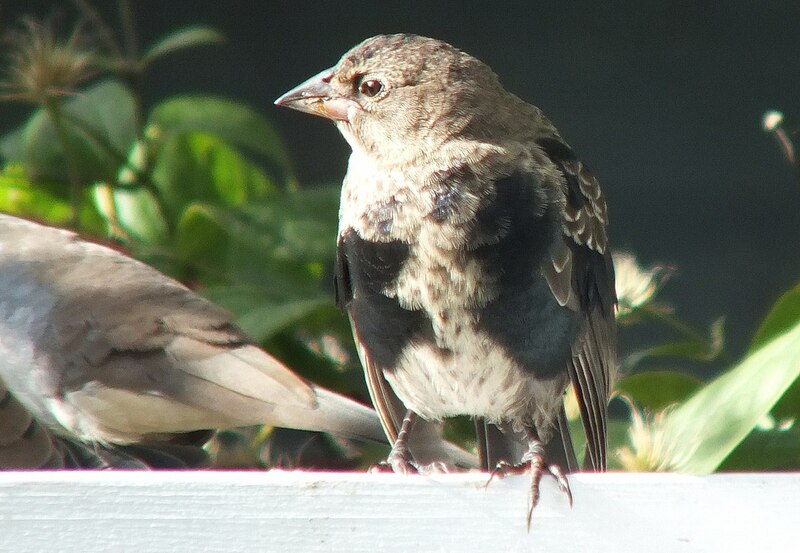 It turns out that this beautiful bird is a juvenile Brown-headed Cowbird (Molothrus ater). Once I had the verdict from several more experienced birders than myself, I was somewhat disappointed because Brown-headed Cowbirds are not entirely looked upon favorably. 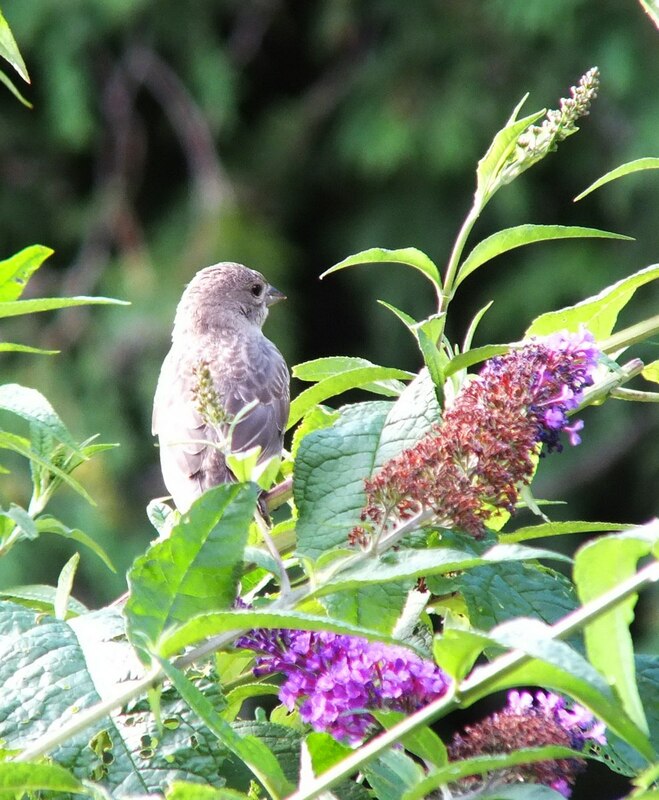 They are notorious for being brood parasites, which means that they lay their eggs in the nests of songbirds, who then hatch and raise the young Cowbirds as their own at the expense of their own hatchlings. 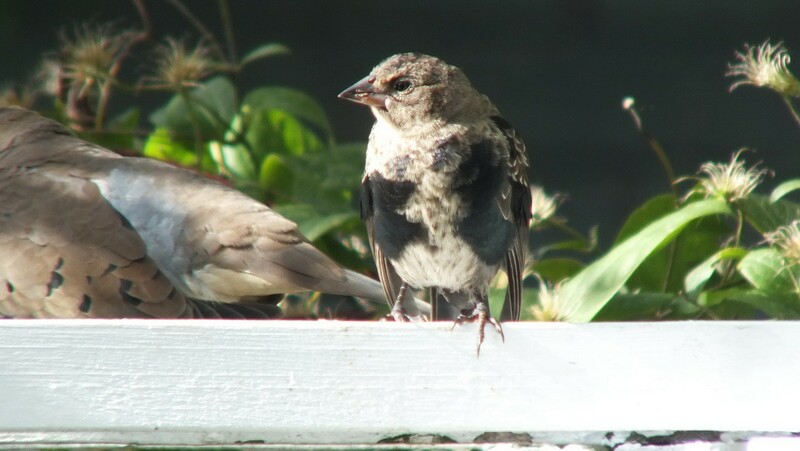 Although this behaviour sounds pretty harmless, in fact, the adult Cowbirds will often push the eggs of the host birds out of the nest so that the host birds raise only the newly-hatched Cowbirds. 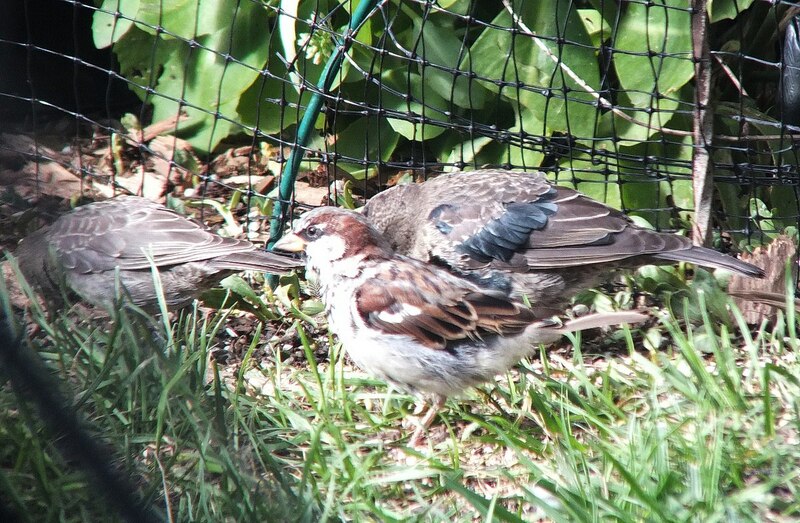 Bob and I ended up with at least one pair of juveniles in our backyard late that afternoon. This young male spent 10-15 minutes grooming its feathers, then flew to the ground and foraged for safflower seeds below my bird feeder. 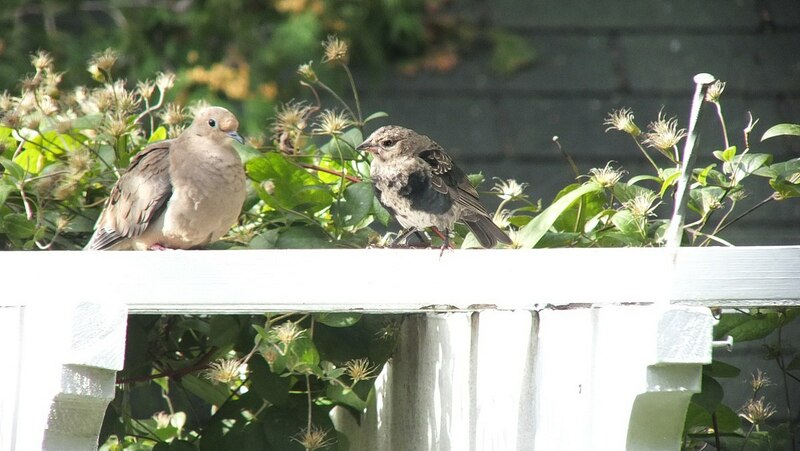 It was then joined by a juvenile female (the grey bird on the left) that showed no black plumage whatsoever. The two Cowbirds were definitely interacting with one another; the male was puffing up and lifting his wings periodically. 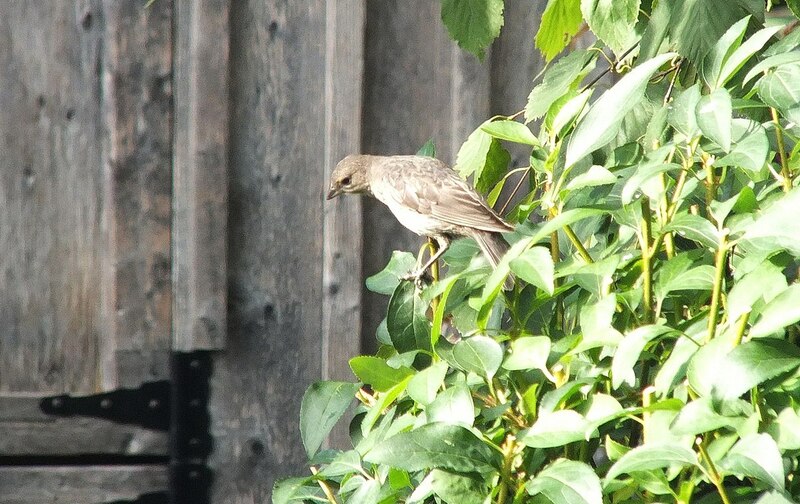 This female Cowbird, seen at Lynde Shores Conservation Area, has the colouring of a mature adult, solid greyish-brown all over. 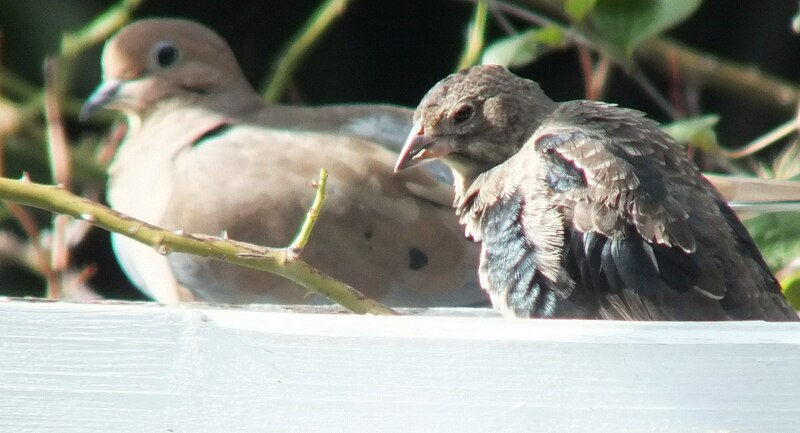 The glossy black feathers of this juvenile male will eventually cover the entire body of the bird with the exception of the head. 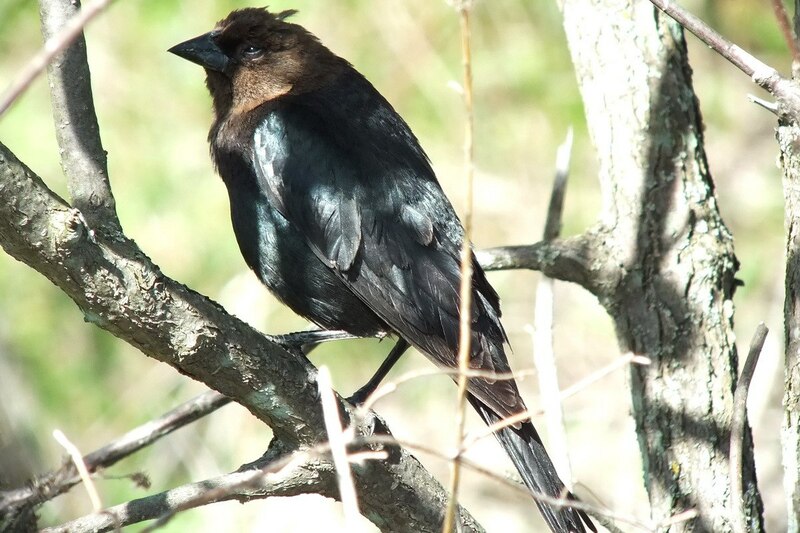 Earlier this year, Bob and I spotted this mature male Brown-headed Cowbird basking in the sun at Thickson’s Woods in Oshawa. You don’t really have to go far afield to find these problematic birds, as they are common most everywhere in North America, although those in the northern regions do migrate to the southern United States or Mexico for the winter. before proceeding to the water fountain for a drink and refreshing bath. 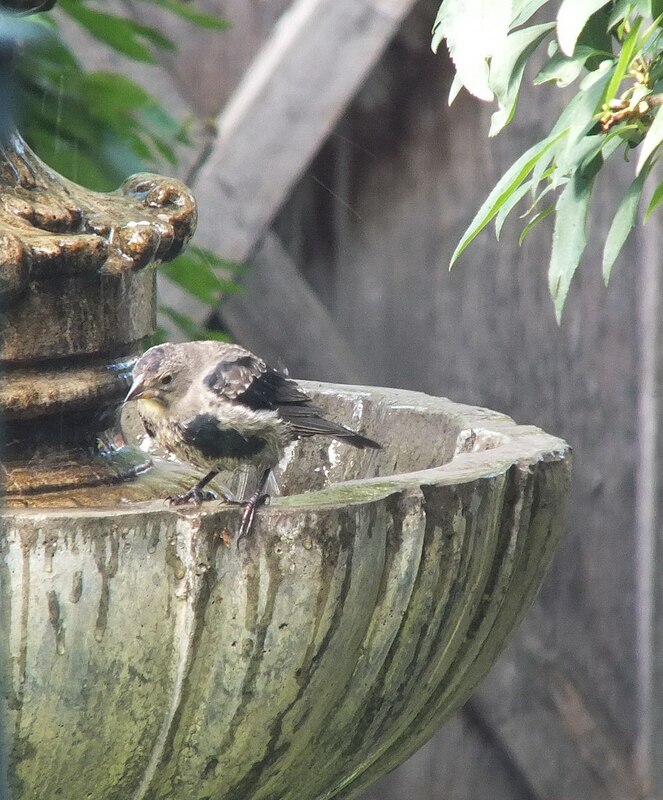 Although I had to admire the soft grey plumage of the juvenile female, I couldn’t get past the fact that these birds are the most maligned members of the blackbird family. Their eggs have been documented in the nests of 220 different host species. Because the females do not build their own nests, all of their energy is put into laying eggs, sometimes 3 dozen a season. 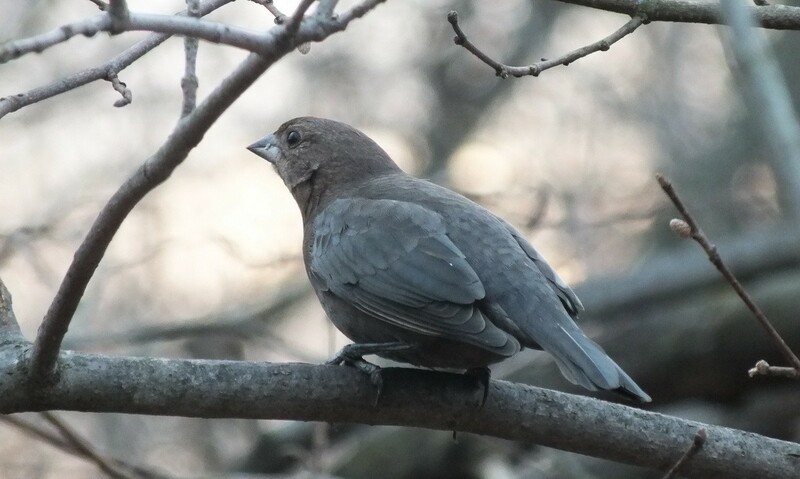 Brown-headed Cowbirds consume both insects and seeds as part of their diet. 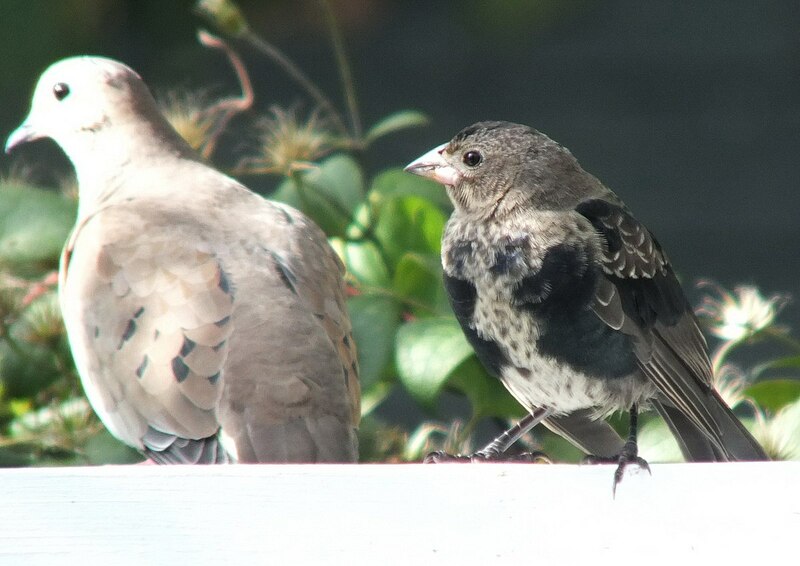 Both their short, thick-based bills and their heads resemble those of finches rather than those of other blackbird species, and the Cowbirds are generally smaller in stature. 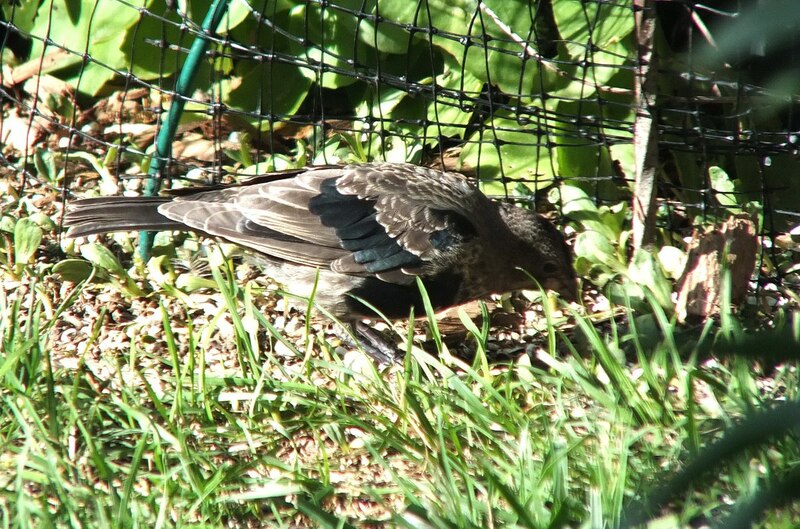 Cowbird eggs often hatch prior to those of the host species, and because of their rapid growth, the baby Cowbirds out compete the hosts’ chicks for food and space in the nest. They have even been known to push the hosts’ chicks from the nest. The end result is that some or all of the hosts’ hatchlings usually perish. 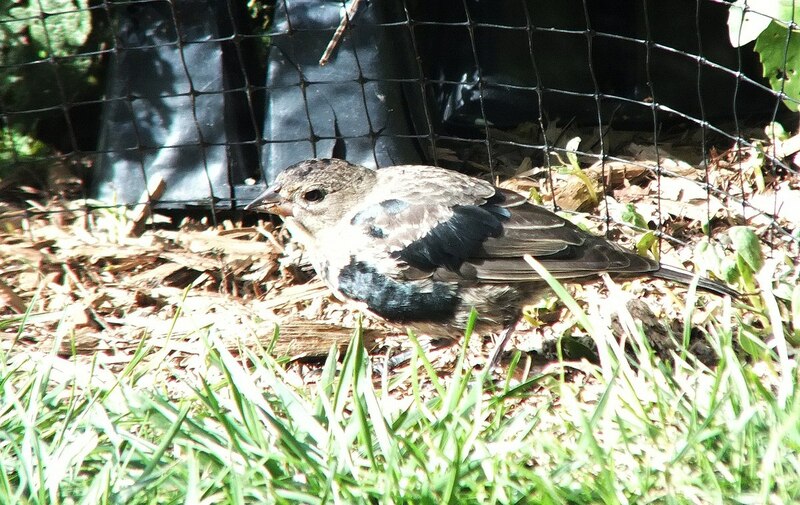 So, while I can’t help thinking that this young Brown-headed Cowbird is actually quite beautiful, it is unfortunate that so many songbird species are struggling for survival due in part to the Cowbirds’ practices. Their behaviour is said to have come about because, back in the day when they followed herds of bison, the female Cowbirds did not have time to build their own nests before they had to move along. It just goes to show that necessity is the mother of invention.